Play, talk, visit the library, and read, but remember … you can’t read if you don’t have a book. That’s just the start of what Jackie French has to say in her new book targeting parents, teachers and librarians. Jackie is Australia’s Children’s Laureate and the award-winning author of over 140 books. She’s also dyslexic. Jackie is passionate as she shares her knowledge and understanding of reading, gained from years of experience and research. I Spy a Great Reader is chock-a-block with advice and ideas. You’ll find information about child development (improving coordination can help reading), surprising facts and figures (around one in eleven children has a reading problem), and lots of tips on how to help your child become a great reader and love books (if they find a book boring, don’t make them finish it, help them find one they’ll enjoy instead). 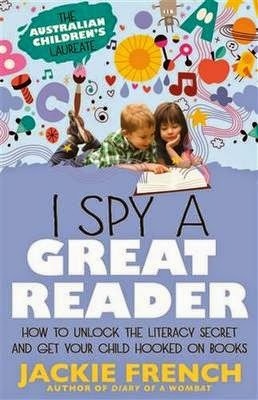 I Spy a Great Reader is broken into small, easy-to-read sections including early childhood age groups and the different aspects of reading - teaching basic reading, handwriting and spelling, homework, reading and teaching problems, and so on. There are also sections on teenagers and reading, family reading, book groups, the different ways children learn, and making a difference in the classroom. There are plenty of games, activities and projects suggested, too - everything from reading to their teddy or the dog, to playing I Spy with sounds, and writing words with water pistols (great fun in summer). Jackie also demonstrates her “Share a Story” philosophy throughout I Spy a Great Reader as she shares brief stories about children in situations just like those she is writing about, case studies if you will. They put her advice into context and make it easy to understand what a difference finding the right approach can make. Added to that is the use of anecdotes and analogies (just as you can’t live on cherries and chocolate, it’s best to have a healthy reading diet and read widely). The comprehensive table of contents and sub-headings, plus handy boxed information, makes it easy to dip in and out of I Spy a Great Reader, or you can simply read from beginning to end. This is a book every parent, teacher and librarian should read - it’s educational and inspiring. There is no one size fits all solution to learning to read, however I Spy a Great Reader is a reminder of the importance of being able to read, and offers valuable insight and guidance in helping children to do just that.